Work-At-Home Success offers a variety of resources to help you learn about and find a work-at-home job. Weekly Job Announcements: Sign up for the newsletter to get jobs and other work-at-home information each Friday. You’ll also get the Jobs Online Report and a list of companies that frequently hire for free with your confirmed subscription. Use the sign up box to the right. 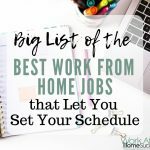 Search for Work-At-Home Jobs: Here’s information and resources for doing your own work-at-home job search including sites that I use regularly. Get Job Search information here. Companies with telecommuting programs: Here’s a list of companies that have official work-at-home programs. Visit the company sites to determine if they jobs. Or use the list as supporting documentation for a Work-At-Home Proposal to your boss. Get the Telecommuting Company list here. International Telecommuting information – For visitors who are not in the US, visit this page to learn more about telecommuting and work-at-home job resources in your country. Ask Your Boss to Work-At-Home: Tips to writing a work-at-home proposal and presenting it to your boss. Work-At-Home Job and Telecommuting tips and information articles are posted regularly on the site. 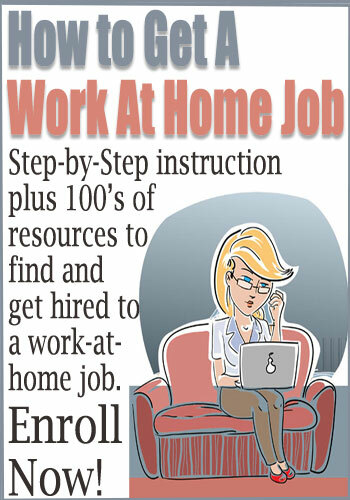 Simply click the “Telecommuting”category to see all the articles related to work-at-home jobs. Want more information. How soon can I start? Hi Christina, There are tons of ways to make money at home. How soon you start depends on what you choose and how well you go about getting started (i.e. looking/applying for work or starting a home business). 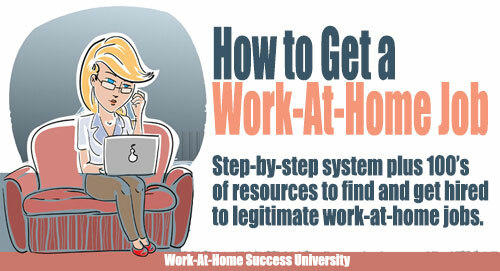 Work-At-Home Success has tons of information you need to figure out the best option for you, avoid scams and more. I recently published a book online through Amazon and wanted to know what’s the best way to advertise? Does it always have to be a search engine? Or are there less expensive ways or free ways to do this? Hi Isa, The very best time to start promoting your book is before it’s release. However, marketing is also something you do ongoing. Marketing tactics that work well and don’t cost a lot are: 1) have an author website or blog, 2) Social media including Goodreads which is a social media network for readers 3) contacting bloggers who target the market for your book and ask for a review or set up a blog tour 4) get positive reviews of your book (as your beta readers or offer a few free copies to people for a review), 5) press releases. Good luck with your book! I was reading the above post about Isa writing a book. I am writing (or should I say attempting) to write a children’s book (series). I have never done this before – do you have any recommendations of how to write, illustrate and publish ebooks. I am looking for the steps on how to do this. Also above you mentioned contacting bloggers who target your type of book, how would I find these bloggers?? I am not very tech/computer savy with social media. Hi Kelly – Book writing is a big topic. There is the writing process, then preparation and then marketing. You also have to decide if you want to get an agent/publisher or self-publish. 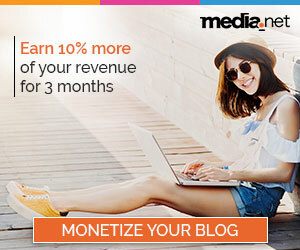 There are many blog/websites can offer tips in each. I have a ebook publishing course through WAHS University that can help with getting your book on Kindle, Nook etc. This course covers much of the information you need, but isn’t specific to children’s picture books. There are many other good books on writing / publishing you can check out as well. The basics are to write a good book that people want to read, have it beta read for feedback and professionally edited. If you’re self-publishing, you’ll want to get a great cover and write an enticing blurb (covers and descriptions sell books). I recommend getting some reviews, which you can get by sending the book to bloggers or others who know your book topic/subject. You can do a Google search for reviewers (i.e. children’s book bloggers). Then you need a marketing plan. Where do your book readers hang out? How can you put information in front of them that will entice them to buy it. This is the stripped down version, but hopefully it gives you an idea of what you need to research/learn about. Good luck. I would love to work online, but everything I come across is a scam or I need to pay a “one time” fee of some amount of cash that I don’t have. I honestly don’t have anything to lose, but at the same time I have nothing to give to gain what I need. If that makes sense? What I am saying is I need a job working from home that I can actually be hired with out having to spend money out of my own pocket that I literally do not have! All I want to do is work and provide. I have so much to offer, but no one gives me the time of day. Hi Chelsie, Finding work at home can be frustrating. However, I find that people who struggle the most often don’t understand working at home and are looking for opportunities in the wrong places. If you want a work-at-home job, there are many of them. But they’re not something you’ll simply sign up to do. First you need to figure out the skills and experience you have to offer and then look for jobs that need what you can do. I post jobs every week day and include lists of places you can search for more jobs. I encourage you to read about telecommuting and avoiding scams to help you learn what to look for. Good luck! Hello, I wonder any job as work at home for deaf person as me? Hi Tanner, I’m sure there are jobs for deaf people. Many work-at-home jobs don’t necessarily require hearing. Most online jobs wouldn’t require hearing (i.e. writing, web design, etc). 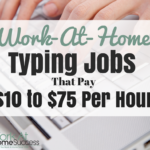 You might try http://www.ntiathome.org/work-at-home-jobs-disabled.shtm as well. Good luck. i was wondering if you have jobs for high school students who are wondering to make some part time money. I don’t have a specific list of jobs, but many of the more flexible ones might be open to that. It’s something I need to research. Many high school students take a more entrepreneurial route earning money blogging and Youtubing. My name is sushma. I am a life sciences graduate (Microbiology and Genetics). Currently residing in Kuwait. I am looking for a home based job. I have 2 years of experience in general transcription work. Any job option with you or could you suggest any site where i can get a legit home based work.Please help me find good home based work options.Checked few links mentioned but they are providing work for the US residents.Please provide the links who give work outside US (residing in any part the world). Now a days so many online scams bursting up really scared to take up any job just like that. please help me find one legitimate home based work. I am currently looking for data entry positions. I have a diploma for medical office administration and a certificate from high school for administrative assistant. I am very good with data entry. I need to find a work from home position. Right now I am making a little over 9 an hour and need to find something making more than that. Please help!! Hi Denise, You want to be careful searching for data entry jobs, as many (if not most) are scams. Further, I’m not sure the legit ones pay much more than $9 an hour, although working from home can often save you money over working outside the home so you can afford to make less. Along with data entry, you might consider doing virtual support work which can be like administrative assistant work. 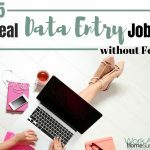 You can check out this post on data entry work and this post on becoming a virtual assistant (both include job sources). Good luck! I’m a mom of 4, two of them are babies. With the price in daycare working would barley cover the bill. So my husband works while I stay home and raise our children and care for our home. 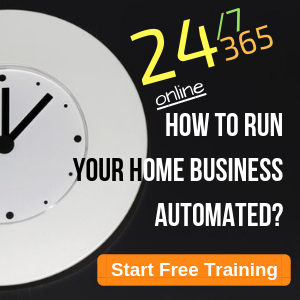 I’ve been searching for a way to bring in some extra income from home. Everything I came across is a scam I swear. I wish someone would just say hey this is who is legit and I go from there. I’m sick of searching and getting dead ends. Hi Amanda, I understand your frustration. If you’re only finding scams, then you’re probably looking for the wrong type of work in the wrong places. There are tons of legitimate ways to work at home, but the offers that promote menial work for big bucks are scams. People who work at home do much of the same type of work others do… customer service, teaching, writing, nursing (ie insurance checks), and much, much more. The answer is to start with the skills and experience you have, and look for options that allow you to use them. There is a ton of information here at Work-At-Home Success including legitimate work at home jobs and other options. However, you need to understand that you won’t simply sign up and work at home. It takes time and effort to find and get hired to the right job. 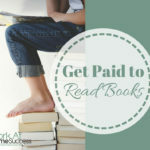 I recommend starting on the Get Started page for information you need to know before you look for work, plus tips and resources on finding the right options for you. Work at home is possible, if you do your research and find the right job or business for you. Hey. I’m hoping to get some advice. I’m a mommy of a 3 month old and breastfeeding. My husband is the only income for our family but I would like to bring in at least $500 a moth to help him with bills but there is lots of scams and the only legit one I have heard of is AVON, Uhaul or selling some products like wax candles. I would really like to stay in my field working with or for protecting and saving animals. I’m a Certified Vet. Assistant, planning to become a Animal Control Officer when I go back to work. Just need something real right now with a business location to sign the I-9 forms and pick up a paycheck. Just don’t trust sending my information online. I’m located in Phoenix, Az. Thank you. I’ve never seen any legitimate jobs in assembly work. Remember, if the company asks for money for anything other than a background check, it’s not a job (employment). It could be a legitimate business opportunity but it could also be a scam. If you want to make money in crafts, you’re better off to make your own and sell them yourself. You can sell them online through a site like Etsy or at craft fairs, farmers markets, or through consignment. I hope that helps. I am a retired medical transcriptionist looking for something in the line of customer service. My problem is, I have always worked as a contractor, mostly from home, so I don’t really have a good resume or references. Medical transcription is on its way out due to word activated computer programs and the services I have contracted with are no longer in business. Any ideas? Hi Mary Ann, none of your past contracts are willing to give you a reference? Any work you’ve done, contract or not, should be on your resume, just as any other job would be. For example, I list contract work like any other job on my resume, but I indicate it was contract, along with the dates and duties. 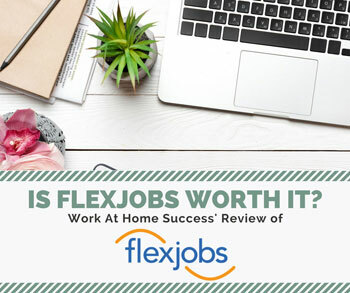 Further, the fact that you’ve worked at home should be highlighted to show you know what’s involved and have experience in being self-motivated and accountable. Customer service doesn’t necessarily need experience, but they do want assurances that people can work from home, which can provide. I am noticing a lot of companies have a “Brand.” What is a Brand? If I start a home based business am I supposed to have a Brand? Hi… I need a home based job which is easy and less time consuming. As I’m a mbbs Student I need to work as well as study so plss if u help me out for this it will be a high favour. Waiting for positive response. 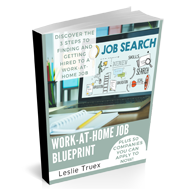 Finding a work at home job is no different than looking for a regular job. It starts with your skills and experience that an employer needs. There is tons of information and resources here at WAHS to help you learn about jobs, companies that hire, how to write a resume, and more. Good luck.